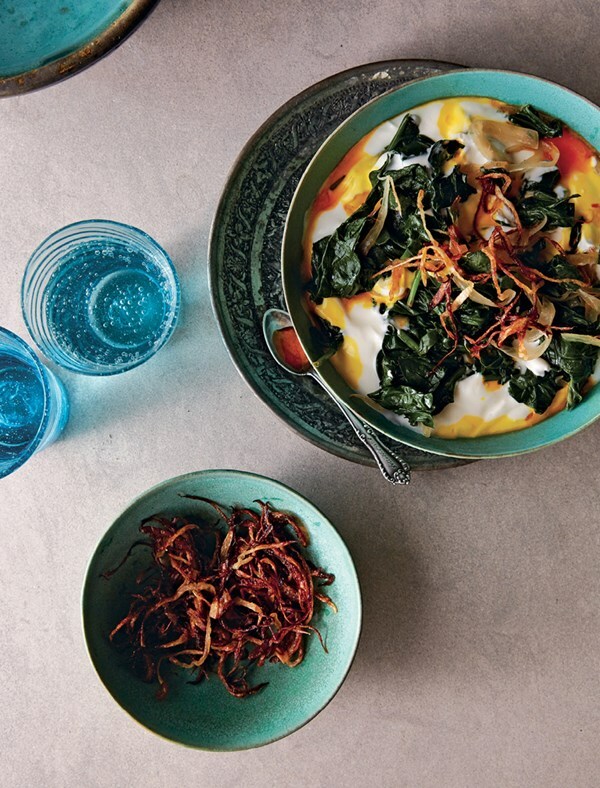 This is the recipe that was mentioned in a Persian cooking class just before this cookbook was released. The instructor had seen a preview. This selects among basil, coriander, mint, summer savory, parsley, scallions, fenugreek leaves, tarragon, watercress, dill, arugula, chervil, chives and sorrel; suggested additions include radishes, cherry tomatoes, cucumbers, pickles, fresh cheese, walnuts ... I was especially glad to see sorrel to the Armenian version that I had learned. After a class with Omid Roustael, I really want to try this with fresh fenugreek - even if I have to grow it myself. Thanks to a class by Omid Routaei, I use rose water or orange blossom water instead of plain water depending on what is most appropriate for the dish. Keep this on hand to drizzle over everything! I served this with the Persian Cafe Kebabs (meat patties version), and it was an excellent condiment with the lamb. A refreshing side dish and super easy to pull together. This is delicious! Our guests, who are usually meat-and-potatoes kinds, ate it all with great alacrity. I was afraid the pom. molasses might be too sweet, but it worked perfectly. This was incredibly popular both with both adults and children. Each element is delicious separately and heavenly in combination. Delicious! Recipe claims 8oz mushrooms serves 2 as main course and 4 as a side. I recommend doubling the recipe. Don’t skip including the dried lime. It really makes the dish special. Oh, sigh. This was quite bland. It cried out for ... bacon. Delicious winter soup. Be sure to use the most sour pomegranate molasses (I used a brand called Dwadi). I'd also add the herbs closet to serving time to preserve greenness. Such a warming, comfortable bowl! I had to use a pomegranate molasses substitute (reduced unsweetened cranberry juice into a syrup) due to an allergy, and consequently (maybe?) had to add a bit more than instructed, but once I did..... oh my! The flavors are incredible. Good ... perhaps not as special as I had hoped. I wonder what I could add to spark it up a little. Hmm. I added some cooked ground pork, some fennel seed, and some cumin seed. Certainly delicious, but so far from the original dish as to be unrecognizable. Used pork loin and marinated for almost 48 hours, the flavor of the wine was very evident but these were super dry. Would not make again, there are better pork kebabs. This makes a succulent, flavorful roast chicken. Making the stuffing ahead works well. We were unable to find dried cherries and substituted a combination of tart cherries and cranberries. The substitution works. Needs more oil for mouthfeel, otherwise seems too naked. Lovely combo with tongue. Excellent salad, slightly tart and refreshing with subtle flavorings. I could eat this by the bowlfull. This is AMAZING! I think I might either process the walnuts less (so they are chunkier) or grind them finer. We used boneless, skinless chicken thighs and it turned out great. First time making kheer with broken rice as suggested in the recipe. As for congee, broken rice works perfectly for this pudding. I used a rich Jersey milk that was not homogenized, a choice I'll repeat. This is a very good, mildly flavored rice pudding that we all loved. This lightly spiced tea (I used Dragon Well green) is an ideal accompaniment for the Persian rice pudding from this cookbook. I choose a thin rosewater raisin cookie (nan-e keshmeshy) recipe from Omid Roustaei to complete the course. Naomi Duguid is the goddess of cookbooks guiding us through new countries with her words and recipes. 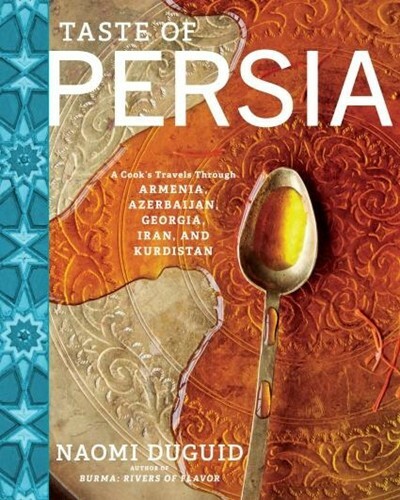 Persia is one of those culinary destinations that is only just getting the respect and attention that it deserves, and this cookbook is the perfect introduction to it. Our ambassador to this tasty world is the incomparable Naomi Duguid, who for more than 20 years has been bringing us exceptional recipes and mesmerizing tales from regions seemingly beyond our reach. Nearly 125 recipes, framed with stories and photographs of people and places, introduce us to a culinary paradise where ancient legends and ruins rub shoulders with new beginnings—where a wealth of history and culinary traditions makes it a compelling place to read about for cooks and travelers and for anyone hankering to experience the food of a wider world.